Please understand that any one of these symptoms can be a sign of ECU capacitors beginning to fail. - You do not need all or most of them to have this issue! ● problems in getting into diagnostic mode or scanner says "no communication"
I was actually experiencing several of these symptoms including ECU not wanting to communicate! So, with no engine diagnostic codes to work with, I checked all of the grounds, voltages and other obvious causes, and then in a MacGyver-Steve Jobs moment of insight, I decided it must be the electrolytic capacitors inside the ECU, which had appeared fine in an earlier inspection a few months earlier when the problems began. I suspected it was the capacitors because I discovered this problem back in the 1990's on Nissan 300ZX and the Mitsubishi DSM models. History just keeps repeating itself! - It was also bound to be ECU-related, because this diverse set of issues has only on thing in common - the ECU! sure enough, upon re-inspection, the corrosive leakage was very bad, so bad that the main circuit board could barely be saved!, I replaced all 6 electrolytic capacitors, and now every single problem listed above is gone! - and the engine also seems to have more low end power than it had even before the symptoms above appeared! 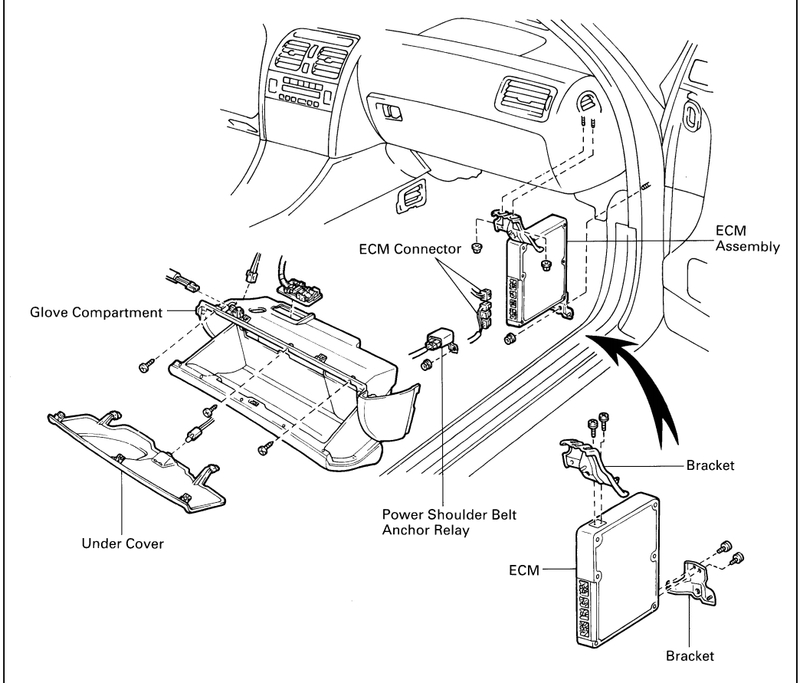 if you recognize ANY of these symptoms listed above, bad ECU capacitors are a likely culprit! this is NOT something a junkyard computer would solve, it is an age and sitting up problem, a junkyard ECU would have the same issues. IMPORTANT: It is critical that you use the exact premium Japanese low ESR capacitors I have linked to below in the recommended capacitors section, even if you are having someone else do the work, the correct capacitors are very rare type and they will not have them locally - if they use other capacitors, the repair will not solve the problems you are having! the power difference alone makes it worth doing, and just because an electrolytic capacitor looks good, doesn't mean it is - 93-97 LS models are showing up with this capacitor issue in particularly high numbers and other models such as SC model are showing up in high number on even earlier years such as 1992, this also affects the 2JZ and other Toyota engines! a new ECU would also solve the problem, those cost $2400 at the dealership, the parts I used to make mine just like a new one are less than $20 delivered from Digi-Key - and it is important to order from an authorized dealer of these great capacitor brands in order to avoid counterfeits - so FORGET EBAY, AMAZON, ETC. it is CRITICAL that the replacement caps be low ESR type and from one of the brands listed above - don't cheap out on your vital ECU! 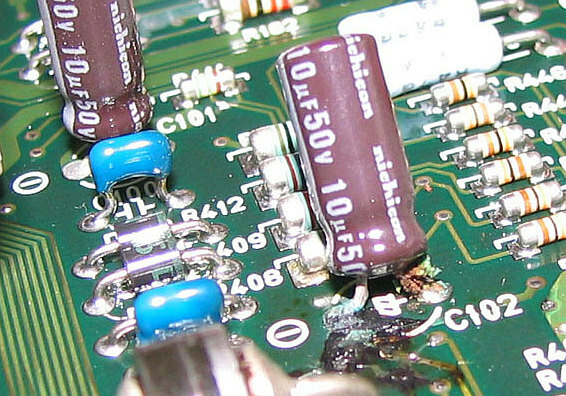 WARNING - DANGER: this is not a good first-time soldering project, the existing capacitor removal and associated desoldering, cleaning, inspection, soldering and re-inspection is involved and is in some very tight places, you must be experienced at soldering and pretty good at it, or else you need to locate someone who is very experienced at soldering, and then you should buy the special capacitors this job requires, and then let him or her do the operation of replacing them - the NipponDenso ECU in your LS400 is a delicate piece of very expensive electronics. If you wouldn't feel comfortable taking apart a laptop computer and getting it back together successfully, then you probably do not want to be doing the electronic portion of this repair. If you need further advice on recapping, you can post here in this thread! WARNING: You must use premium Japanese low-ESR capacitors for this repair to be successful, this kind of capacitor is very rare, they do not stock it locally, you must order it from the links below! 1998 and up owners: you can replace the capacitors of your original ECU without affecting security and the theft deterrent system, but keep in mind that if you get another ECU say from ebay or a junkyard, it will have to be reprogrammed by the dealership or a better locksmith before your car will start with any ECU that is not the original one that came with your car! WARNING: You must use premium Japanese low-ESR, high temperature, long life, high ripple rejection capacitors for this repair to be successful, this kind of capacitor is very rare, they do not stock it locally, you must order it from the links below! DANGER! - Will Robinson - COUNTERFEIT capacitors are a SERIOUS EPIDEMIC - make damn sure your capacitors come from the factory authorized sources below, those capacitors you found a deal on, on ebay or elsewhere online are very likely FAKES! - most premium Japanese capacitors in the United States are shipped from three principle distributors: Digi-Key, Mouser, and Newark Electronics. Anywhere else is likely a questionable source! the voltages specified in the recommended caps below are sometimes higher than the originals, this is a good thing! no one understands Toyota ECU operation and design on Club Lexus anywhere in the same league with our special Japanese guest Yamae! just consider him a guest expert ECU engineer from Nippon Denso, and you wouldn't be far off. I take NO responsibility for any damage you do to your ECU from any information you obtained from this post. DO THIS AT YOUR OWN RISK!!! If you completely hose your ECU, don't come whining to the cowboy! Nor do I want it sent to me for repair! Untangling someone's 'handiwork' is more frustrating than battling the original problem! If you have any doubts about your skills, DON'T TRY THIS!! - If you do screw it up, it is not the end of the world, just purchase the same part number ECU on ebay from a high rated (99.5%+) seller for around $125 or so and find someone to do this cap replacement job who has experience. Also - NEVER use 'cold heat' types of soldering irons!! They work off the principle of an ARC welder, and emit a current. This can instantly destroy your ECU board when contact is made. If a good soldering station is not available to you, a 40 watt solder pencil with a standard tip on it will work fine. if you have patience and soldering skill, it's not too difficult! CAUTION: BE VERY GENTLE with flexing the 2 or 4 gray ribbon cables that connect the 2 mainboards - they will not tolerate rough handling! - they will take a normal amount of flex required to open up these boards flat for working on them, so you don't have to be a complete scaredy-cat! CAUTION: - static electricity can kill an ECU - some people wear anti-static wrist straps, but I find them a pain, here is a better plan and what I do in my electronic's bench: all 100% cotton clothing and bare feet! FIRST: - take photos of what caps go where originally, plus make a DIAGRAM of cap sizes & placement! 8. - using medium large safety pin, re-make holes in desoldered pads in board to accommodate easy installation of leads of the new caps, heat up the solder pad, insert safety pin, let cool and the stainless safety pin will twist right out, leaving a perfect hole for new cap leads! 9. - solder in new caps, double checking polarity (+/- orientation) - use 63/37 rosin core solder, and get some rosin solder flux (I like Radio Shack p/n 64-022) and cover the solder area well - slather it all over where the new caps will be soldered - the new capacitors do not like extended heat, just get in and get out with the soldering iron, and make sure iron is ample wattage (like 40W+) - I do not like to apply heat for over 3-4 seconds at one time. Use LIBERAL amounts of the RS/CAIG rosin flux mentioned above in the parts list, this is the key to making the soldering process behave! 15. - BEFORE cranking engine the first time, click the ignition switch over to the RUN position for 1 minute to let the other ECU components acquaint themselves with the new caps and let them precharge. Thanks to Yamae for researching the part#'s for the North American ECU's. As far as I investigate the variation of the ECU for the North American market, there are ECUs as follow. what say you, all you experts? IMPORTANT: - for this repair to work, the capacitors are very critical, these are a very rare type, low ESR, high ripple rejection, high temp, long life, premium Japanese capacitors from only 4 companies in the entire world. your local electronics shop does not have them, your repair guy does not have them, ebay has counterfeits, amazon has counterfeits, the place advertising ECU repair does not have them. You must order them from authorized dealers Digi-Key or Mouser or Newark ONLY - to avoid counterfeits and incorrect capacitor types, using the links in post #1 above. Please post this up! This may solve a ton of issues fellow members are experiencing! Yes, very interesting. Will be looking forward to the pics. Toyota has started to use Nichicon's electrolytic capacitors that containing “quaternary ammonium salt / compounds" in the late 80s and has kept using them for a bit more than a decade. The reason why they used those capacitors was simply because the internal impedance was low enough and showed good performance in removing noise and ripples at DC lines. A little before that many electronics industries in Japan started to use similar capacitors that were for non automobile use and faced serious leaking problems in the early 90s. :sad: The details are written below but all in Japanese. I don't have the time nor the ability to translate all the contents so I will just translate the title. The “phantom” here means the electrolytic capacitor which contains infamous “quaternary ammonium salt / compounds". Judging from the title, it is dangerous to use this type of capacitor without taking any special precautionary countermeasures. Most of the electronics companies in Japan stopped using this type of capacitor in the early 90s or mid 90s for fear of leaking problems. But many automobile industries kept using them because they needed good performance. Another reason was that they have been used in high reliability type-capacitors. Nichicon has been manufacturing special versions of this type for the automobile industries using specially coated lead wires with special sealing rubbers. One of my colleagues evaluated them and found the automobile type much better than those types designed for home appliances applications but the lifespan was not as long as those electrolytic capacitors that use regular liquids. Also the high reliability types were very expensive. I cannot show you the details of the evaluation results but what I can say is that the lifespan is longer than roughly 10 years or so but you cannot expect a lot if used for longer than that. As I fix different ECUs as a volunteer, I came across many failed Nichicon's PF(M) type capacitors these days, some 12 years old, some 15 years old. What I can say now is that my colleague has done a good job evaluating the capacitors using an oven in the accelerated mode. :thumbup: In accordance with that and from my own actual experience, ECUs older than 12 years are ready to fail someday soon or later, that I can say with confidence. Below is a failed capacitor used in a 97 Celsior. You can see how the leg has corroded and the part on the board where liquid has leaked out. Those who want to replace Nichicon's type PF(M) capacitors to avoid future problems, be sure to use low ESR type capacitors. Never select capacitors just seeing the voltage and the capacitance. I recommend you to use Rubycon's type ZLH or Nippon Chemicon's type KZH. These do not contain infamous "quaternary ammonium compounds" but their ESR is low enough. You also have to pay good attentions against electric static discharge when doing the replacing job. A wrist strap is definitely needed to use. Without it you might damage the ECU. Regarding capacitors Rubycon's type ZLH and Nippon Chemicon's type KZH, the availability in USA is not so good. LScowboyLS was kind enough to try to find capacitors that were OK to use and he listed up at the post #1. Those capacitors are good enough. so what if i replace my capacitors and it fixed nothing? 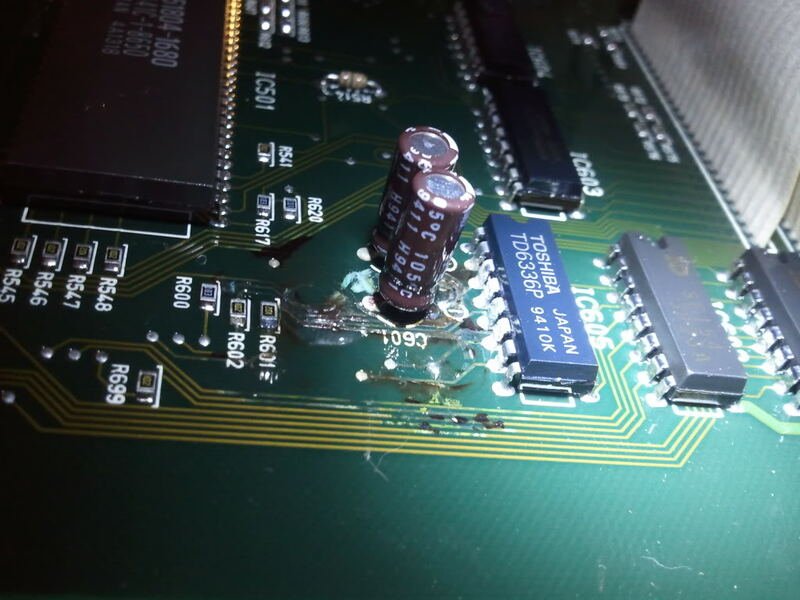 you couldn't have even acquired the correct capacitors that Yamae & I specified with the 24 hour period between your messages, much less had time to do all the board prep and desoldering and soldering and installation and removal of the ECU - get real!